INDIANAPOLIS – Dec. 6, 2012 – The World of Outlaws STP Sprint Car Series released its ambitious schedule for 2013 on Thursday at the International Motorsports Industry Show, with the premier sprint car series competing in more than 90 races at more than 50 tracks across 23 states. The schedule, which will continue to grow in the coming weeks as several additional dates are finalized, kicks off with the 42nd annual UNOH DIRTcar Nationals Presented by Summit Racing Equipment Feb. 15-17 at Volusia Speedway Park in Barberville, Fla., near Daytona Beach. The World of Outlaws STP Sprint Cars then head west for March and the first two weeks of April with events at The Dirt Track at Las Vegas (March 6-7) and at Tucson (Ariz.) International Raceway (March 9) before California races at Thunderbowl Raceway in Tulare (March 15-16), Stockton 99 Dirt Track at San Joaquin Fairgrounds in Stockton (March 22), Silver Dollar Speedway in Chico (March 23), Antioch Speedway in Antioch (April 5), Calistoga Speedway in Calistoga (April 6), Kings Speedway in Hanford (April 12) and Perris Auto Speedway in Perris (April 13). Texas, Kentucky and Oklahoma host their lone events with a race at El Paso Speedway Park in El Paso (April 16), at Paducah International Raceway in Paducah (April 19) and at Salina Highbanks in Salina (April 26) as the World of Outlaws STP Sprint Car Series makes its season debut in the Midwest. The schedule heats up throughout the spring and summer with at least 10 races per month from May through August, including a variety of big-paying events and two unique races. 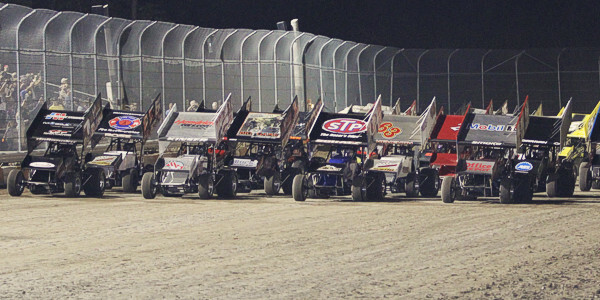 The ‘Month of Money’ returns in July and August, highlighted by the $50,000-to-win, 30th annual Kings Royal at Eldora Speedway (July 13), the 22 nd annual Don Martin Memorial Silver Cup at Lernerville Speedway (July 16), the $20,000-to-win Summer Nationals at Williams Grove Speedway (July 19-20), the $20,000-to-win Ironman 55 at Federated Auto Parts Raceway at I-55 (Aug. 3) and the $150,000-to-win, 53rd annual Knoxville Nationals at Knoxville Raceway (Aug. 7-10). Additionally, for the first time since 2001 at Bristol Motor Speedway, the World of Outlaws STP Sprint Cars will race on a pavement track covered in dirt. Elko Speedway in Elko, Minn., will cover its 3/8-mile oval for a race on May 10. The Outlaws venture to Canada for five races as well, beginning July 27 at Autodrome Drummond in Drummondville, Quebec. Cornwall Motor Speedway in Cornwall, Ontario, hosts a race for the second straight year (July 28) and Ohsweken Speedway in Ohsweken, Ontario – where NASCAR star Tony Stewart has claimed victory the past two years – will race on July 30. The seventh consecutive Oil City Cup at Castrol Raceway in Edmonton, Alberta, on Aug. 23-24 concludes the races in Canada to start the final West Coast swing of the season. The World of Outlaws STP Sprint Cars will compete in eight races at seven tracks between Aug. 30 and Sept. 8 throughout Washington, Oregon and California. The 51st annual, $50,000-to-win National Open at Williams Grove Speedway (Oct. 4-5) highlights a handful of races in October before the World of Outlaws STP Sprint Cars wrap up the season at the seventh annual PEAK Motor Oil World of Outlaws World Finals Presented by NAPA Auto Parts at The Dirt Track at Charlotte on Nov. 7-9. For up-to-date changes throughout the offseason, visit WoOsprint.com. Tickets for select events can be ordered online by clicking WorldofOutlaws.com/tickets or by calling 877-395-8606. The World of Outlaws STP Sprint Car Series is brought to fans across the country by many important sponsors and partners, including: Armor All (Official Car Care Products), STP (Official Fuel Treatment), Hoosier Racing Tire (Official Tire), Gravely Tractors (Official Lawn Equipment), University of Northwestern Ohio, VP Racing Fuel (Official Racing Fuel), Vicci (Official Apparel); in addition to contingency sponsors, including: Cometic Gasket, Comp Cams, JE Pistons, Klotz Synthetic Lubricants, KSE Racing Products, MSD Ignitions, Penske Shocks, Superflow Dynos and Wix Filters; along with manufacturer sponsors, including: Astro Titanium, ButlerBuilt, Fuel Safe, Intercomp, J&J Auto Racing, Jake’s Carts, Racing Electronics, S&S Volvo and TNT Rescue.